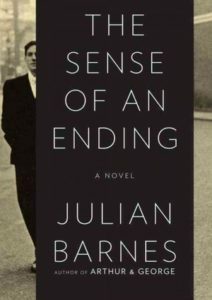 I was looking for a short, yet thought-provoking audiobook to act as a sort of palette cleanse between two light-hearted, popular works of fiction, so I opted for The Sense of an Ending by Julian Barnes. It turned out to be the perfect choice. In less than five hours, we journey through the life of the narrator, Tony, and the story of two relationships from his youth, one a friend and one a lover. Now in his sixties, Tony is confronted with the truth of those relationships and forced to reevaluate his past behavior and his own carefully curated story of self. The audiobook narration (by Richard Morant) was terrific—the voice you hear becomes Tony, which really brings the story to life. This character-driven book examines the importance of memory in shaping self and questions what we remember as truth. I recommend it for fans of Kazuo Ishiguro and Marilynne Robinson. This entry was posted in Kathy and tagged fiction, literary fiction on January 17, 2019 by laurab@ippl.info.